Do you find yourself craving ice cream, intoxicated by an image of french fries or unable to resist the candy jar at a co-worker’s desk? Research shows you’re not alone. Certain foods — particularly processed foods that are high in sugar, salt and fat — don’t just taste good, they also can be addictive, said scientists at a UC San Francisco symposium on food and addiction. Food addiction is still a controversial concept in the scientific community. But researchers find strong evidence that certain foods can trigger binging, craving and withdrawal, responses that are similar to those produced by addictive substances like alcohol, cocaine and tobacco. “I don’t think sugar is more addicting than cocaine, but I do think sugar is addicting,” said addiction expert Mark Gold, co-editor of the book “Food and Addiction” and keynote speaker at UCSF’s Oct. 27 Sugar, Stress, Environment, and Weight Symposium. Identify your triggers: Awareness is an important first step. Pay attention to those moments when your cravings start so you can figure out what unleashed them. “You have to work to control the triggers as soon as possible,” said Kerri Boutelle, a UC San Diego professor of pediatrics and psychology who conducts clinical trials with kids and adults who are overweight and obese and have eating disorders. Teach yourself to tolerate cravings: “Sugar cravings are a learned response,” Boutelle said. People can be trained to extinguish that response and ride out their cravings, once they realize that those urges diminish over time. Cravings might last 10 minutes, she said. Her research has found that people can gain more control over their favorite foods by looking at, smelling and only taking a small taste of them. Limit children’s early exposure: Kids may be more prone to addiction than adults, so parents should limit their exposure to products with added sugar in their first years of life. Gearhardt, who developed a Yale Food Addiction Scale for children, found that 7 percent of kids meet the diagnosis for food addiction. “This might be setting them up for lifelong problems with eating,” Gearhardt said. Manage your stress: Under stress, people commonly turn to comfort foods high in sugar and fat. 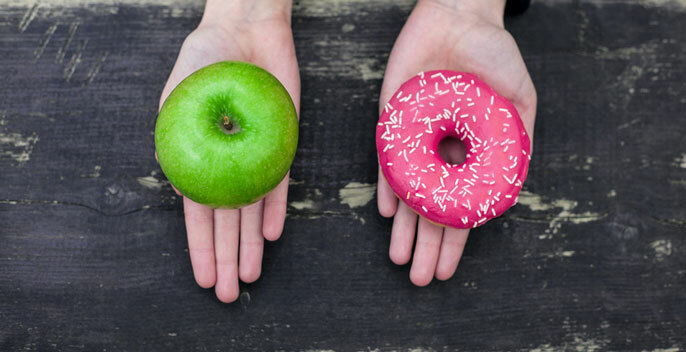 Highly stressed people who eat a lot of high-sugar, high-fat food also are more prone to health risks than low-stress people who eat the same amount of unhealthy food. “Stress changes how we metabolize food,” said Elissa Epel, director of the UCSF Center for Obesity Assessment, Study, and Treatment and co-organizer of the food and addiction symposium. To counter those effects, eat mindfully, meditate and exercise, she said. “Exercise is a huge stressbuster,” Epel said. Give yourself a break: Don’t judge yourself too harshly for occasional junk food lapses. If you take an all-or-nothing approach, you can feel even more hopeless after giving in to your cravings. Food cues are strong and can be difficult to avoid, and it takes time to learn your triggers and get better at making healthy choices. If you have a “learning lapse,” try to do better next time. “You put chocolate chip cookies in the office at 3 p.m. and nobody can resist them,” said Kimber Stanhope, associate research nutritional biologist at UC Davis. Experts on food addiction, overeating, cravings, sugar, obesity and stress at UCSF's symposium on food and addiction answer questions from the community in a Facebook Live session: (From left) Kimber Stanhope, UC Davis; Kerri Boutelle, UC San Diego; Ashley Gearhardt, University of Michigan; Barbara Laraia, UC Berkeley; Elissa Epel, UCSF. Taxes: Berkeley passed the nation’s first soda tax in 2014 and three other Bay Area cities have soda tax measures on the November ballot. A new UC Berkeley study shows a 21 percent drop in the drinking of soda and other sugary beverages in Berkeley’s low-income neighborhoods after the city levied a penny-per-ounce tax on sugar-sweetened beverages. Law: As food addiction science advances, changes in law could follow, said Michael Roberts, executive director of the UCLA Resnick Program for Food Law and Policy and a UC Global Food Initiative subcommittee member. So many food-related lawsuits already have been filed in California that it is known as “The Food Court,” he said. Regulation: Sugar is toxic in current doses and should be regulated by the federal government, said UCSF professor of pediatrics Robert Lustig, whose video “Sugar: The Bitter Truth” has more than 6 million views. Public perception: “It’s not just about regulation,” said UCSF professor of pediatrics David Kessler, who pushed to regulate tobacco while commissioner of the Food and Drug Administration. “It’s how we perceive things. It’s much more effective than any regulation.” As with tobacco, the public perception could change on sugar. “You used to think smoking was very glamorous,” Kessler said. Industry: Manufacturers are under pressure to create products with lower levels of added sugar. “We’re going to see some big shifts in the marketplace with products lower in sugars such as cereals, yogurts, spaghetti sauces and beverages,” Crawford said. UC Davis' Kimber Stanhope explains how the effects of sugar can take your body down a vicious cycle known as metabolic syndrome. Do soda taxes help curb obesity?